This spectacular beachfront townhome's location will take your breath away! The beach and sand is directly accessible from the back patio. Enjoy sitting on the lanai watching breathtaking sunsets, laying on the hammock, or relaxing on the Adirondack chairs. Enjoy swimming in the pool (shared by guests of both units), have fun playing foosball table (on the third floor loft above the master suite) with beachfront views or perhaps watch a movie in the media room. If culinary creativity is your thing, enjoy cooking up a meal in the charming, fully equipped kitchen, all while being able to look out and see the ocean view. For outside cooking, we have a large, side patio with a gas BBQ and picnic table. The bedrooms are on two levels (second and third levels) with their own lofts. The den, on the second level, has a sleeper sofa and you can access the third bedroom via the spiral staircase. There are 2 full bathrooms on the second level and a half bath on the first level. The unit is fully furnished including beach towels, extra linens, pillows, and also includes washer/dryer and garage. Bathroom 1 is on the first floor and is a half bath. Bathroom 2 is on the second floor with bathtub/shower combination. Bathroom 3 is on the second floor with standup shower. Sunset Beach is an exclusive, residential neighborhood with your own private beach right out your back door. New double door refrigerator with ice and water dispenser. All small appliances necessary for a comfortable stay. Spacious deck surrounds the pool with additional paved patio. This pool is located on a spacious deck between the beach and the house and is used exclusively by the two town homes. Full Gourmet Equipped Kitchen with Gas Range. King Suite with pillow top mattress. 2nd bedroom queen bed pillow top mattress. 3rd bedroom twin beds. Den with desk and queen sofa bed. 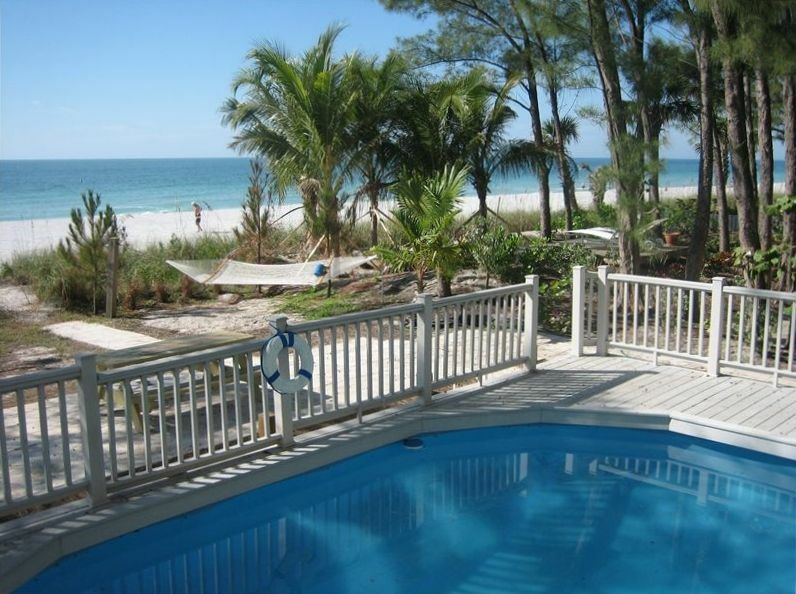 Dine on your BEACH front deck or inside dinning room, Large living room over looking beach. Pool and Spacious Deck. PLEASE NO SMOKING & NO PETS ALLOWED Small children should be supervised as there are lofts and stairs in the house and on the back deck. old parents, toddler and a kid we all had fun here. Beach was wonderful - shallow entry to gulf - you can wade way out in the water. Sunsets were exquisite. Home has an extraordinarily well equipped kitchen and very adequate bedrooms and baths. Overall, home is a bit tired and in need of maintenance, but it did not interfere with our enjoyment of the beach and area. Several maintenance problems arose while we were there (HVAC did not work, oven did not work, pool leaked), however, in each case, the owner responded promptly and repairs were made. It’s not everywhere you can have a pool & beach within a stones throw! Gorgeous sunsets from the comfortable deck, plenty of beach toys to entertain the kids & comfortable chairs for the adults. This home literally has everything you need & more! We cooked our own breakfast/lunch, then had most dinners delivered (there is a notebook with many menus to choose from), & a Publix grocery just down the street. We had a lovey dinner at Middle Grounds Grill, ask for Greg, he was fantastic & the seafood/steaks were top notch! Perfectly clean, comfortable spot with a quiet beach for relaxing. Escape the tourist traps & stay here for a true vacation! We are already looking forward to our next visit! Thank you Joanne for being a lovely host & thank you to the housekeepers (2 sisters that were so wonderful), a “treasure” of a place! Place was great. We had a really good time. Right on the beach. Even fished a little. Too cold for pool swimming. Overall great place to stay. Awesome family home right on the beach with chairs, towels, great deck, and shared pool..... watched sunset every night..... never wanted to leave! Kids had fun racing up the spiral stairs. Great view from deck. Shop at International Plaza-Tampa. Bush Gardens a short car ride away. Enjoy our very own Tampa Bay Rays Ball Games less than 5 minutes away.